Simple app to maximize social media marketing. 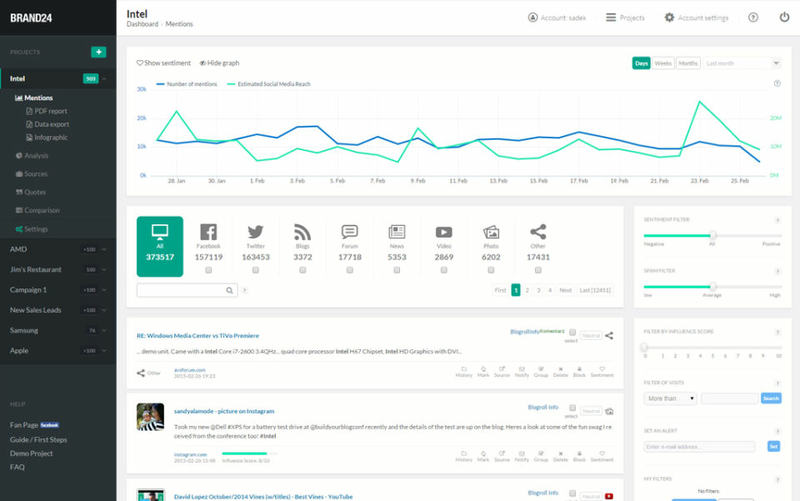 Brand24 is a social media monitoring tool that will help you to increase your customer base and revenue. It has mention feed feature to identify people stating about your product in real-time using which you can take actions regarding it. Using this software, you can also identify the changes in the discussion volume and spot the issue before it explodes. This software allows you to customize your alerts based on defining a criteria. It also has data export options that will allow you to export your data as PDF reports and infographics. 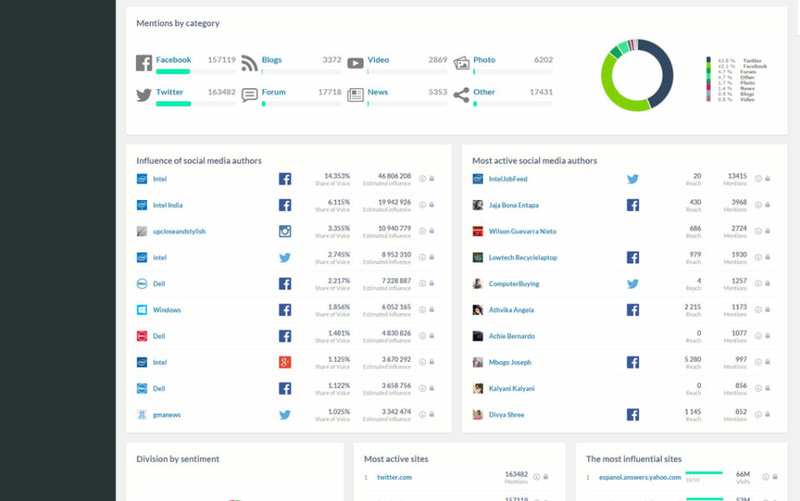 In addition, it has filtering option to narrow down your results based on sentiment, number of visits and mention source. How much does Brand24 cost ? 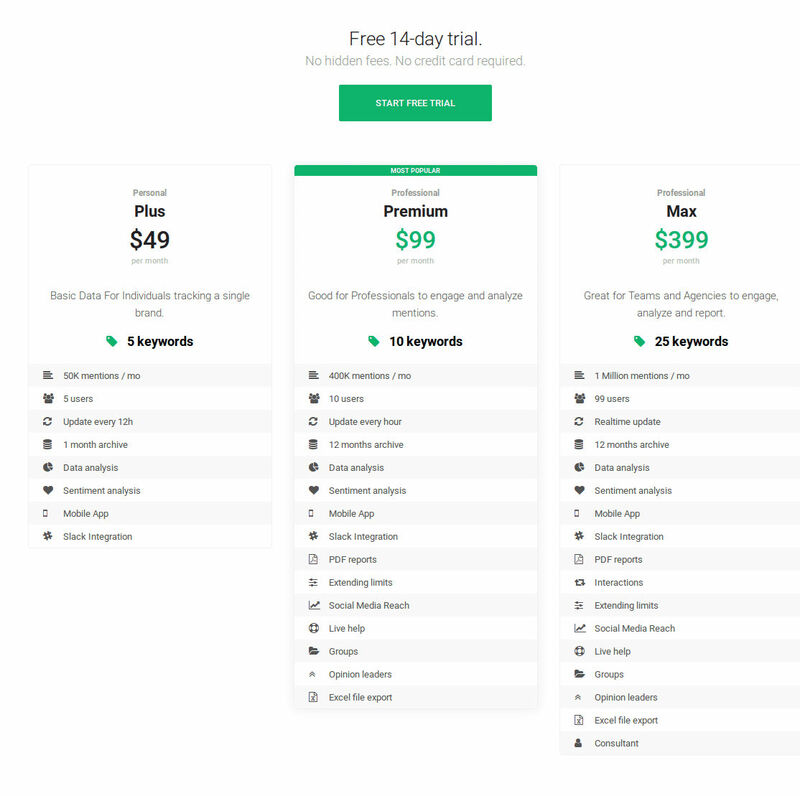 The pricing for Brand24 starts at $49.0 per month. Brand24 has 3 different plans such as - Personal Plus at $49.0 per month, Professional Premium at $99.0 per month and Professional Max at $399.0 per month. Disclaimer: The pricing details were last updated on 14/02/2019 from the vendor website and may be different from actual. Please confirm with the vendor website before purchasing. "It's an amazing tool to use with exciting features"
Brand24 helps me to advice potential users of benefits of social media and how to apply it. Fabulous support. Never wait more than a few moments for someone to respond. It helps us understand who is writing about us, who is mentioning us and what they are saying. 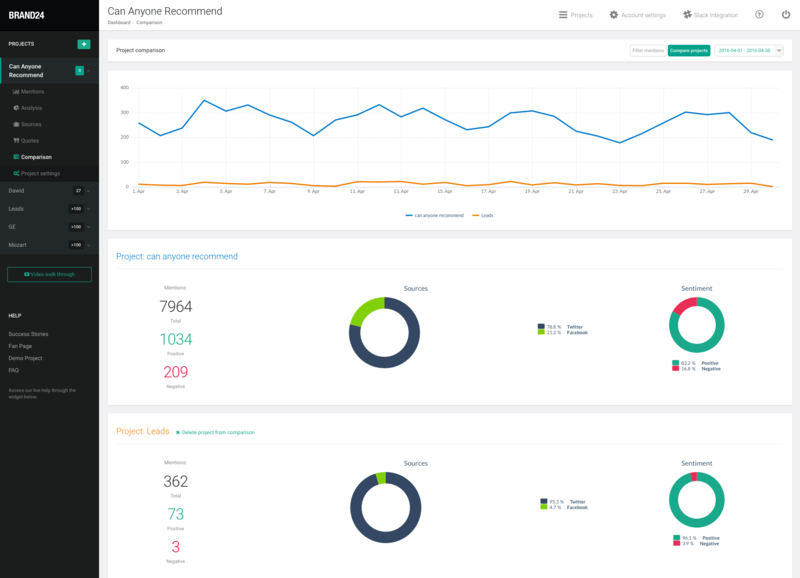 "PDF reports, slack integration, tips to get the best out of Brand24 and awesome support!" 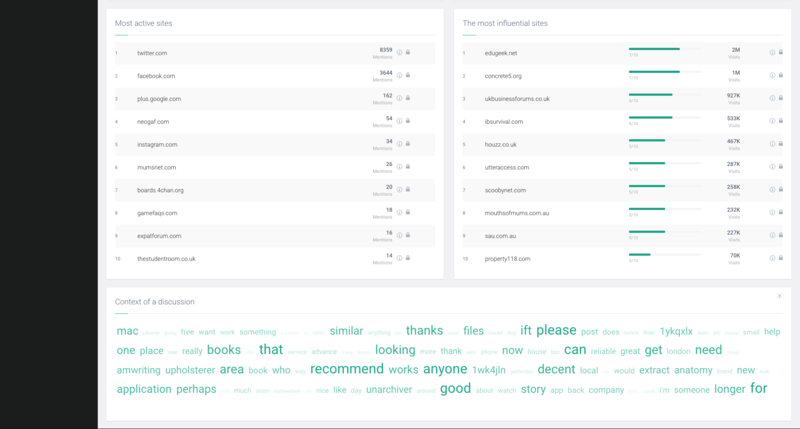 I like the way the Brand24 collects mentions, organises them and allows you to define filters. The introduction of PDF reports allows me to send my client something that they get all the information at a glance. I love the integration with Slack and being able to see a list of mentions as they happen. The ability to view my projects on the go through the mobile app is ace. I have tried many other offerings from competitors and not many have the functionality that Brand24 has at such a good value price point. Their support is fantastic too - shout out to Kuba! I would like to be able to see Reddit as it's own category. 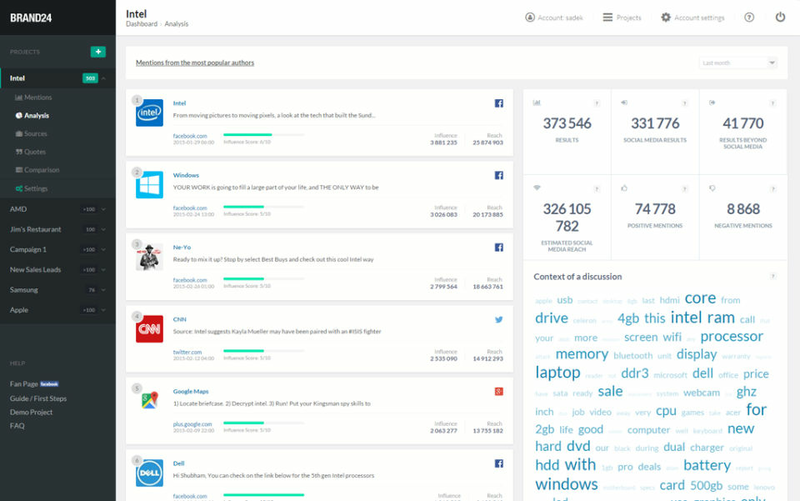 Brand24 helps to identify praise/problems online, the storm functionality is great for this. I am able to provide my clients with white label reports and this is very important to me, the introduction of the new PDF reports are amazing. "Just as easy as a few clicks and so powerful"
As a community manager, it helps me to focus on writing instead on looking for subjects. I really appreciate the tool to follow my influencers as well. Brand24 does many great things, but I must say the estimated reach is a data point clients love. 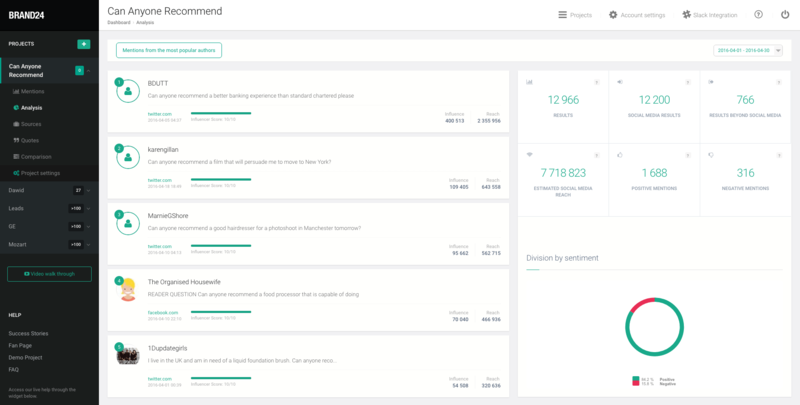 The sentiment score is also very valuable when monitoring social chatter. Clients love data, especially when it comes to an industry they may not completely understand, i.e. digital marketing. Brand24 has proven the value of digital marketing time and again with their numerous data points. There's honestly not much I dislike about Brand24. I guess I would like more control of what goes into the reports they generate, that would be helpful. We have been monitoring a crisis for a client and it has been so helpful in developing messaging to put out to the public. "I use it every single week"
I like that I can put in a specific time period and review all social media mentions we've had in the last week. I'm able to review these and I count them each week to see how we're performing compared to the week before. Every Monday I can go onto the Brand 24 website and put in the dates and count who is mentioning us. I love it. Nothing. I don't have anything to include in this section. A way to track our social media mentions every week. It's consistent. I also like that I can click on each mention and read it if I want to. "A serious review from a comedian"
a lot of clutter to sort through. Duplicate listings frequently appear. "Well-designed tool that fits to every company"
Apart from the tool itself, I love their customer support. If they claim that they can suggest a new Netflix movie to watch, they take it seriously. I like the UI, easy to understand and manage. A simple chart and the list of mentions are my main area of focus, but when I prepare a monthly report, Summary and Analytics tabs are priceless. A massive amount of spam that needs to be cleared out before getting valuable metrics. That's the biggest issue in my current experience. I would also like to see a more polished interface. Don't hesitate to contact the support team. They will help you with setting a new project or improving an existing one. You can follow your brand with Google Alerts, Tweetdeck, Reddit notifications, and other free tools… except it does not cover the full representation of your brand. With Brand24 I found many supporters, unhappy users, and opportunities to show our attention to people who care about our brand. It wouldn't be possible without a monitoring tool. "Really top notch platform and great customer service"
The support team are great and always on hand to help you get the stats you need from the platform. Sometimes the platform can be a bit tricky to get your head around to begin with, but the support team are onhand. We can now track our reach and engagement with much greater accuracy than before. Thanks to Brand24, I know what they write on the Internet about my brand or about topics that I'm particularly interested in.Immediate notifications about internet locations where my brand has been mentioned. 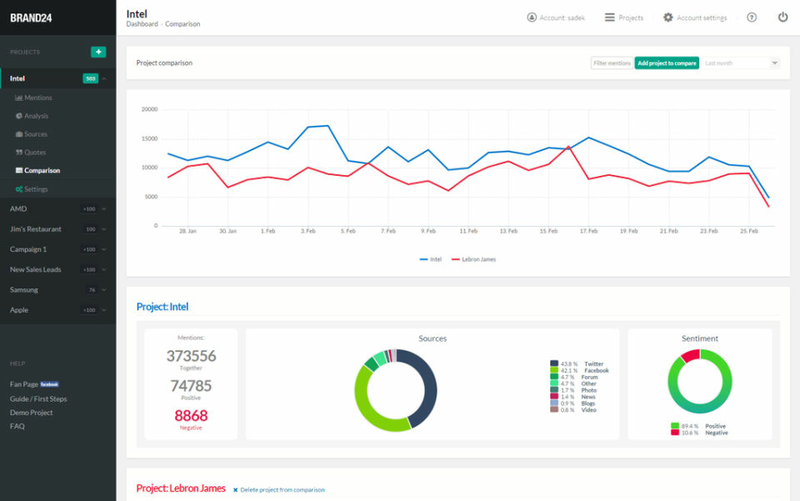 The ability to set specific keywords that monitoring will be possible. Immediate notifications about internet locations where my brand has been mentioned. 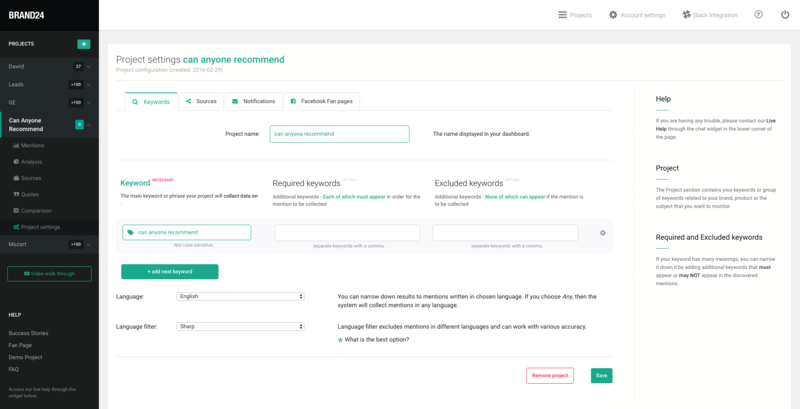 The ability to set specific keywords that monitoring will be possible. Monitoring is not very precise - sometimes I receive such references that are of no use to me.